It came time to depart Hoi An and head to Bangkok. We would be flying there from Da Nang via Ho Chi Minh City. It was more eventful than we’d expected. 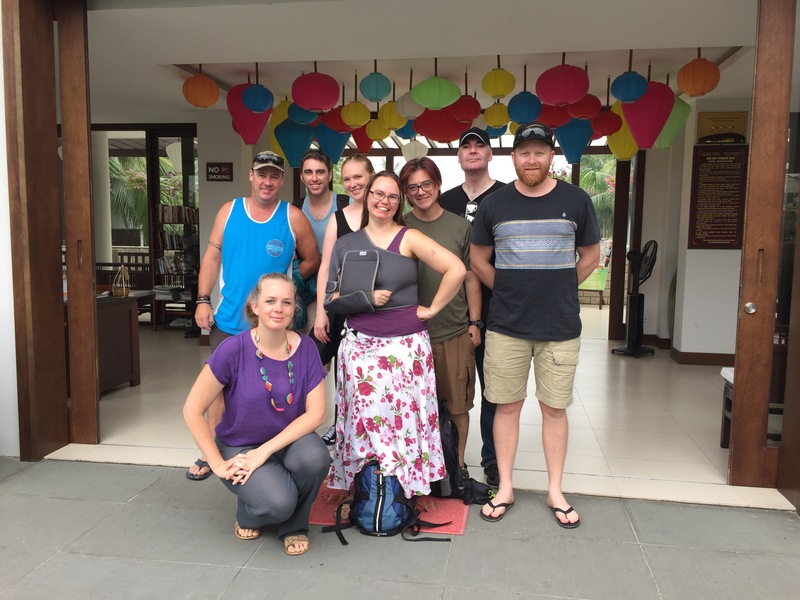 A few days prior the resort manager approached me to offer his thanks to our group for being such great guests, and kindly offered us a free airport transfer for our departure. Maybe he felt it was the least he could do after spending so much money at his resort’s bar day after day. As our flight left at 9:45am and check-in began at 8:45am, he suggested leaving at 7:45am. I made it 7:30am – never hurts to have an extra 15 minutes up your sleeve at an airport, especially with a group. After an early breakfast, we finished packing the last of our gear, all wrote on a card that Matt and Michael would give to Tin later in the day, and took some group photos out the front of the resort. We piled in to our van and got underway as the resort staff waved us off. We made good time to the airport and waited to check-in. When we got to the front we were told we were in the wrong line. Fortunately no-one was in the other queue yet so we went straight to the front. Unfortunately when we got there we were told our flight had left an hour ago, and we’d been advised of the time change by email two days prior. We hadn’t thought to check the flight’s status, and throughout our nine months of travel a few years ago, none of our flights ever got changed. We quickly purchased tickets through another airline but then had to scramble through check-in and security, having to jump straight to the front of both queues, just to make the flight on time. If we’d left 15 minutes later, we may not have all made it on the flight. 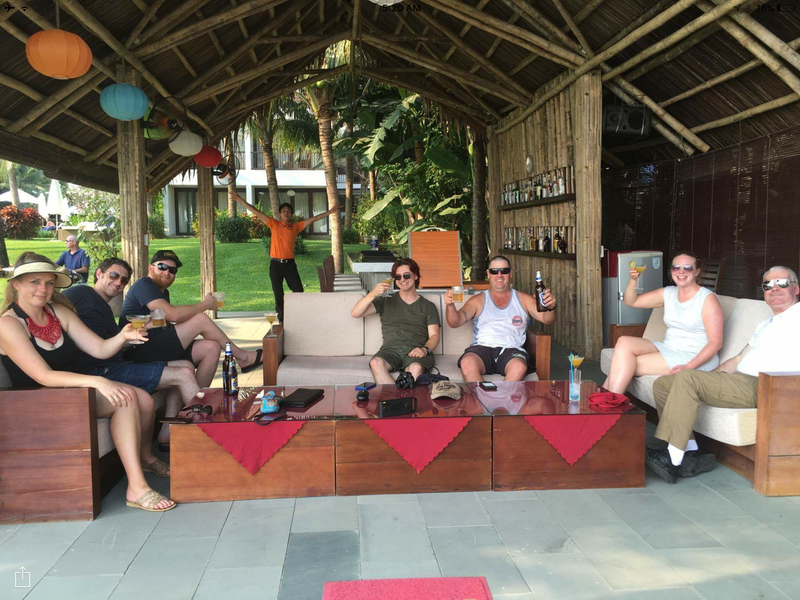 After arriving in Ho Chi Minh City we had some time to kill before our next flight. Quite a bit of time, as it turns out, as nearly all the flights out of that airport had been delayed due to some kind of system error. Our two hour layover turned in to four hours, and we later heard some people had been delayed even longer than that. 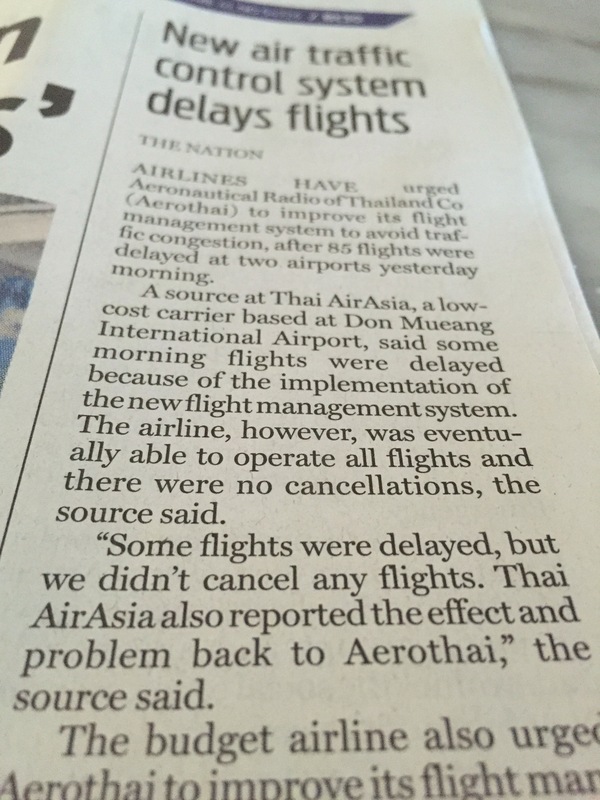 I found this article regarding the delays in the paper the next day. After another quick flight, we finally touched down in Bangkok. We found our driver (who filled us in on how bad the delays had been getting throughout the day) and got underway. 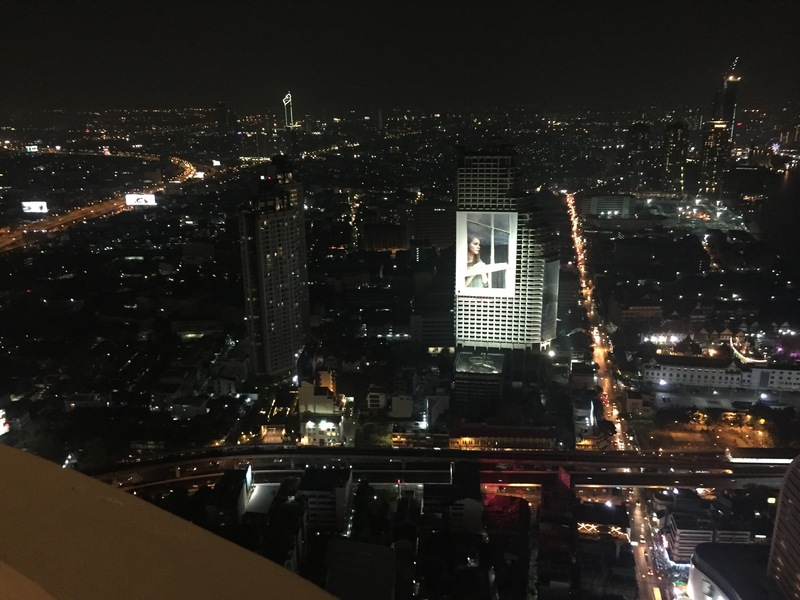 For most people in our group, it was the first time they’d been in Bangkok, and it’s always an impressive city to drive through at night with its myriad of huge advertising billboards and well-lit buildings. We arrived at Lebua at State Tower and started the check-in process. While we waited we enjoyed the lobby’s piano player, who was belting out a medley of random songs. I wish I’d got some footage of this guy, he was really getting in to it! We all tried to figure out each song as it came up. Certainly helped pass the time quickly. 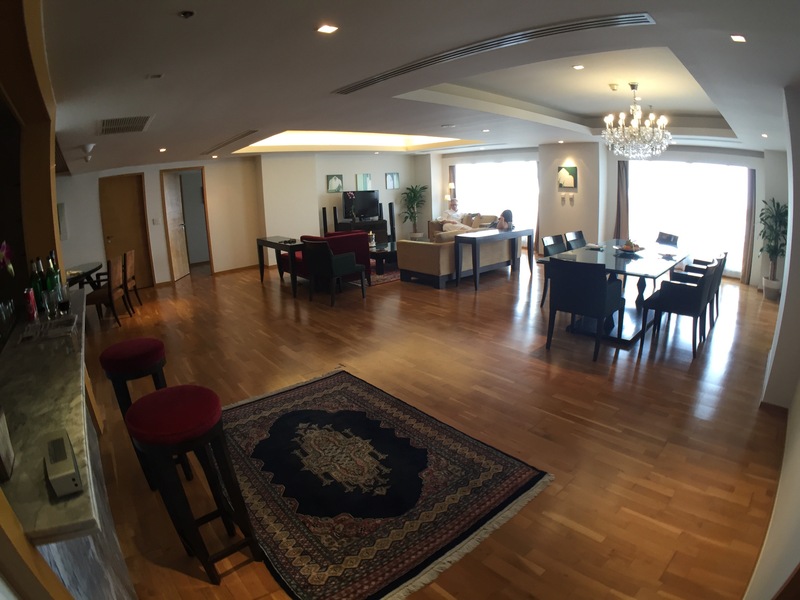 Once we were checked in, we went to take a look at our suite. Kupp greeted us as we walked through the door, as he’d arrived a few hours before us. The place was massive. A huge lounge and kitchen area was flanked on either side by three bedrooms, with two on one side, and one on the other, that one alone being as big as the suite we’d stayed in the last time Amanda and I were there. The living room! Kitchen to the left, and those doors lead to two of the bedrooms. After kicking Kupp out of that room and taking it for ourselves (sorry mate! I promise that when it’s your birthday you can have whichever room you want!) we went downstairs to catch up with the others. 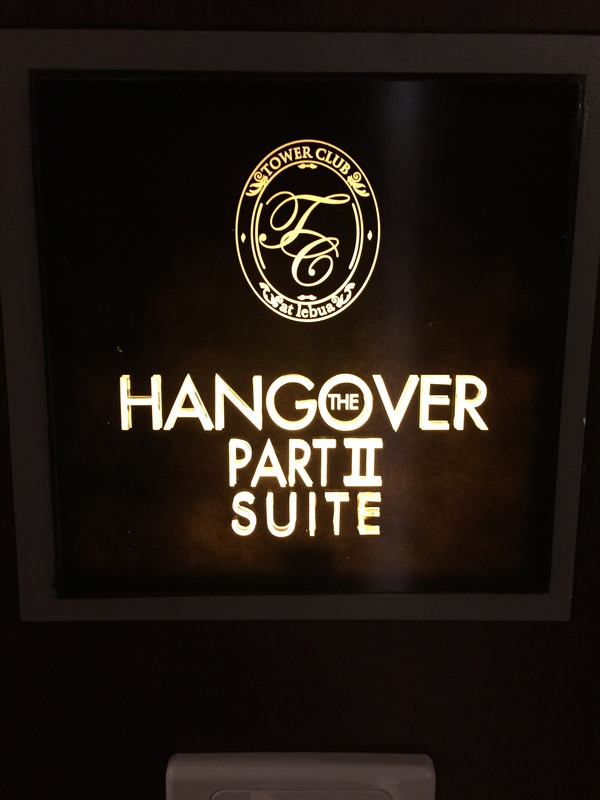 It just so happens that they had managed to score the Hangover Suite. It is ostensibly the same as every other suite, but it has photos from the movie up on the walls, and other decor that references the film. For those not in the know, several scenes from The Hangover 2 were filmed at Lebua, and they’ve capitalised on this in their marketing. 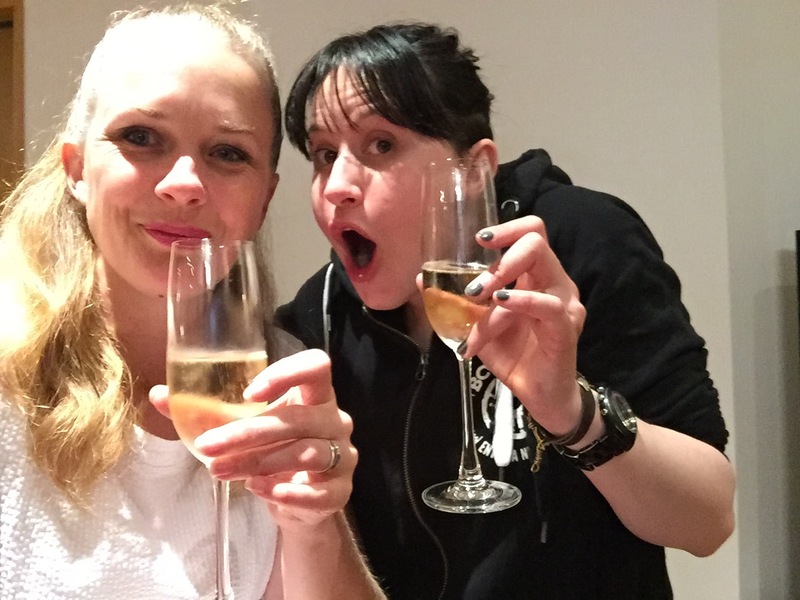 Nikki and Leigh surprised Amanda with an expensive bottle of champagne to kick off the celebrations! 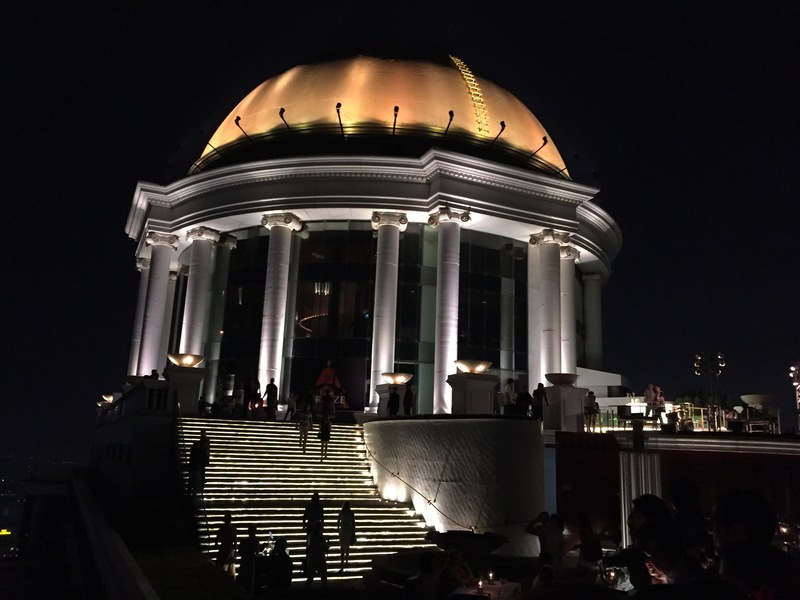 After spending some time catching up, we all decided to spend our first night up on Lebua’s roof at the Sky Bar. Just as we remembered, the views were as incredible as the price of the drinks ($15 AUD for a glass of beer). Still, it was a great way to kick off the Bangkok Birthday Bash! It’s 4am and I’m sitting by the pool at our hotel listening to the occasional boat putter by on the river. After a very early start the day before yesterday, and no sleep all night, I was pretty impressed with myself for having enough energy to hang out at the bar for a few hours before flopping into bed at about 5pm. No caffiene along the way either! My very first impression of the hotel was a cement stairway on a dirty side street (to be fair, all the streets here a pretty dirty) but then we climbed up to the airy, flower-filled reception and a view over a long pool to an emerald lawn leading to the river – it was gorgeous. The grounds are full or orchids and frangipani trees in flower. I met a staff member, Nu, who showed me that if I dipped a finger in the little pond around the dining room, little goldfish would come and nibble my finger. 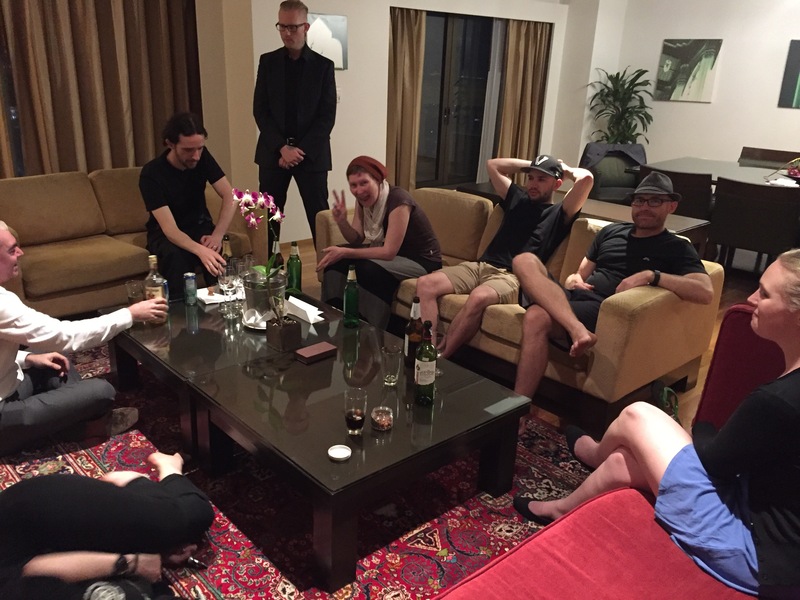 The hotel has a four hour Happy Hour, which started just before we arrived. Two for one cocktails, which made them around $2 each. They also do a street food tasting on the lawn at 4:30 every afternoon. 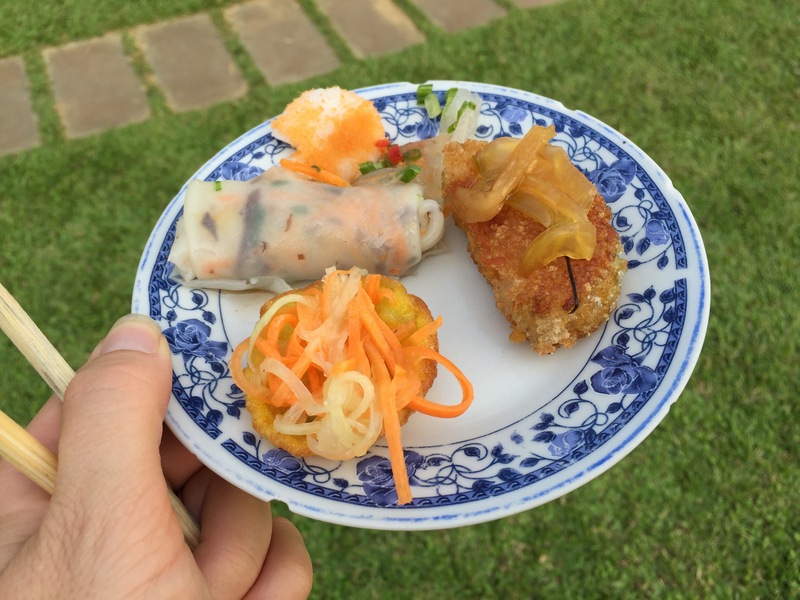 We tried a bunch of tasty fritters, rolls and noodles and I failed to pronounce ‘that was delicious’ in Vietnamese. The only consolation, when trying to pronounce Vietnamese words, is the obvious difficulty Vietnamese people have with English. Even people with big vocabularies are barely intelligible. After being shown to our rooms, Luke and I had a quick, much needed shower, then went for a wander down to the pool and found Matt and Michael already on first name terms with Tin (or Super Tin, as he is now known). 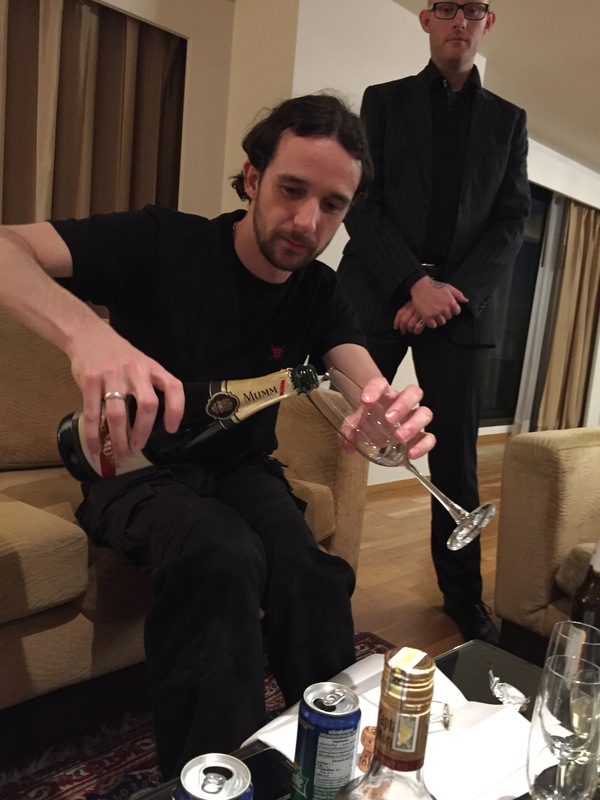 Although I try hard to be friendly to everyone, being with Michael and Matt is like being with two Crocodile Dundees – if Crocodile Dundee spent all his time looking for bars. The weather is looking like being very warm today (and always sticky-humid) but possibly cooler after that so we’re thinking of having a day by the pool to relax then getting our tailoring underway the next day, plus signing up for some cooking classes and tours. Or maybe we’ll just sit by the pool or the riverside bar, which we seem to have commandeered.